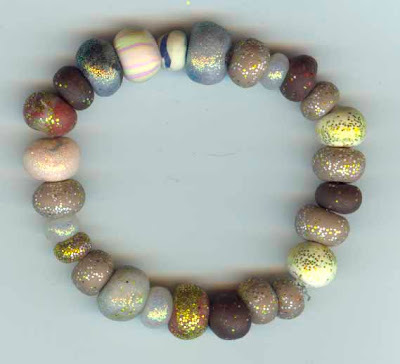 More bracelets with handmade beads on a beach theme, golden sand and glistening pebbles. 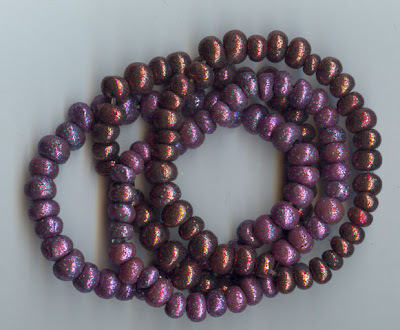 In with the cards was a lovely little surprise for me of some beads for my jewellery! 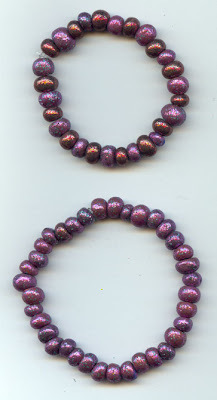 Beautiful sparkly bracelets to fit all sizes in wonderful rich berry colours, can be worn individually, or they look great as a set together. 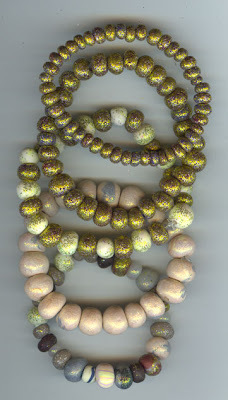 Toby has handmade each bead, rolled, holed and sparkled, then fired and strung on beading elastic. 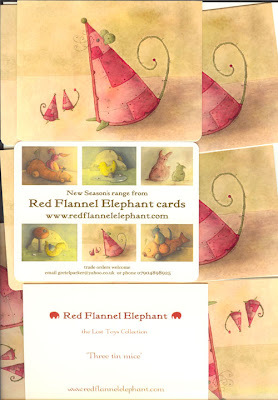 They are £5 each plus p+p, and discount for multiple purchases! 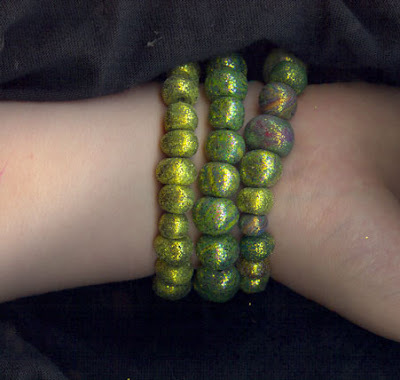 Toby has made a smaller bracelet for a smaller person, perhaps matching bracelets for Mother and daughter? 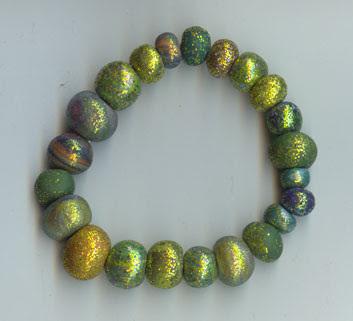 Commissions taken for any colour combinations, beads handmade to order. 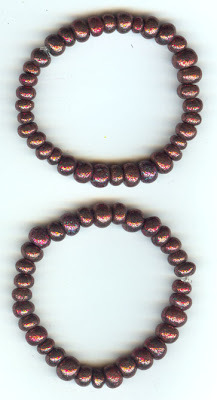 Russet Bracelet, lariat style, to fit all. 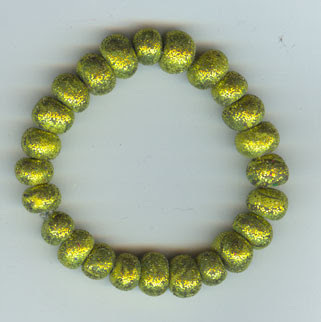 I have just made some new bracelets, which i have named shimmering meadows, because of the wonderful sparkling greens! Each one is unique as you can see in the individual photos, but they go really well together as a set (as seen on my arm!) 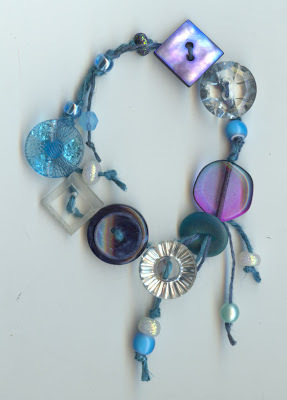 I have handmade each bead myself and strung them on clear beading elastic. or, £14 for the set, plus p+p. 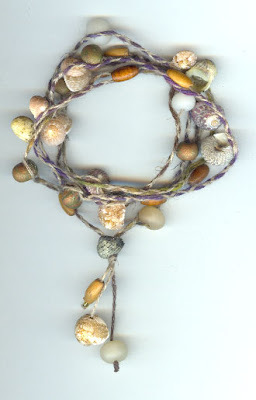 Toby makes Lariat style necklaces and bracelets to order, email info@naturalattrill.co.uk to talk colours! 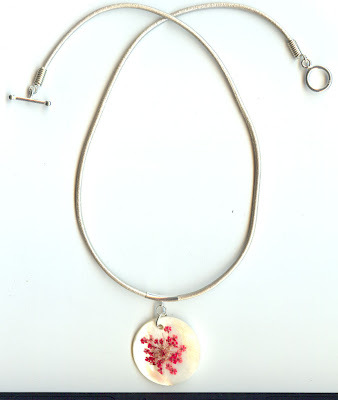 A long lariat, similar to the one pictured here, would cost £24, and a shorter bracelet, £16. 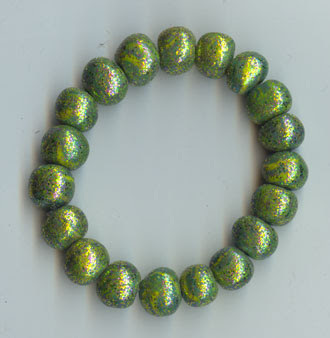 These prices are for pieces with vintage beads and buttons, however similar styles using new materials are much cheaper. 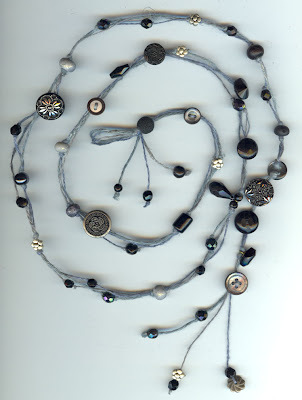 Sybille http://magpiemagic.blogspot.com/ commissioned Toby to make her this long black/slate-grey lariat to match the bracelet I made for her (see earlier post) It is made from 3 strands of hand dyed hemp knotted with some beautiful glass buttons, a bead made from volcanic lava, mother of pearl buttons, vintage glass, and handmade beads, all sorts of treasures! The lariat is versatile, it has a loop which you can slip the other end through to wear, or hook over one of the buttons to fasten. 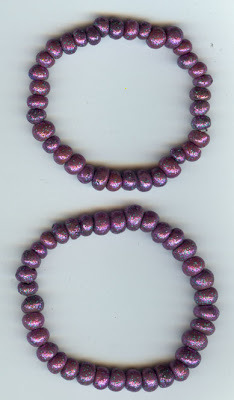 It can be worn as a necklace, or wrapped around the wrist a few times as a bracelet. I was so pleased that Sybille commissioned Toby, as she makes lovely jewellery herself, and could have made her own lariat, but she didnt. 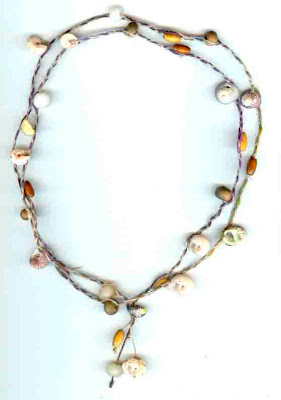 Sybille also bought the natural coloured hemp and shell necklace/bracelet that we recently showed you. What a credit to Toby, selling his work to such an accomplished craftswoman! 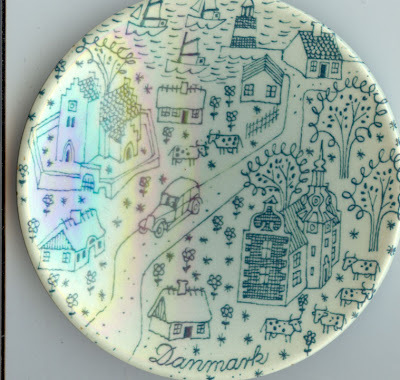 The other day i found this really cute little danish Nymolle plate in an R.S.P.C.A. charity shop for £1.25. The detail is wonderfully quirky. I like the trees best as they are quite abstract, but mum likes the rectangular little flower sized cows!!!! Does anyone know anything about Nymolle? Anyone got any they want to swap for some jewellery?!?! I can feel yet another collection coming on! 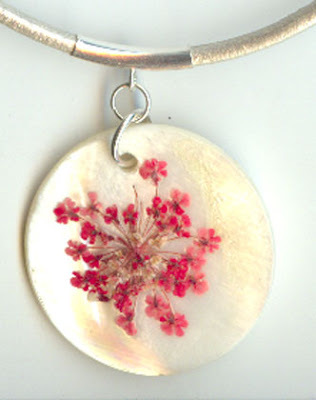 This pretty little pendant, is shell, with a real pressed flower. It is one of Toby's many treasures he has collected over the last couple of years, and he has put it on silver coloured thong, using sterling silver findings and solid silver toggle clasp. It's also good to support small businesses, and individual artists, I would rather give them my money than the big companies. 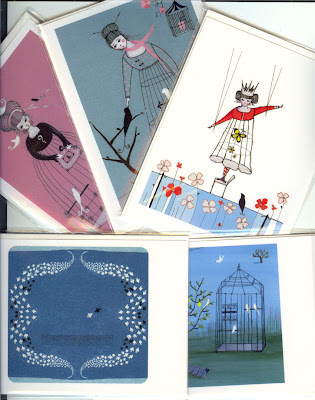 I have just enquired about some beautiful postcards from another illustrator online, and ordered an etching from a blogging friend, so watch this space, and I will show you those too when they arrive!